It was a record year for wildfires in British Columbia in 2017 and many operators, which was good news for helicopter operators in the province engaged in aerial firefighting. By mid-August, 2017 was being described as the worst year on record and the season was a long way from being over. More than 1.2 million hectares burned, surpassing the previous record of 855,000 hectares in 1958, by almost 50 per cent. There have been other notable fire seasons in B.C in recent memory, as well. In 2003, for example, there were major interface fires in Kelowna and the McLure/Barriere region, from two separate fires that totaled some 26,000 hectares each. The Okanagan Mountain Park fire destroyed 238 homes and forced the evacuation of more than 33,000 residents. 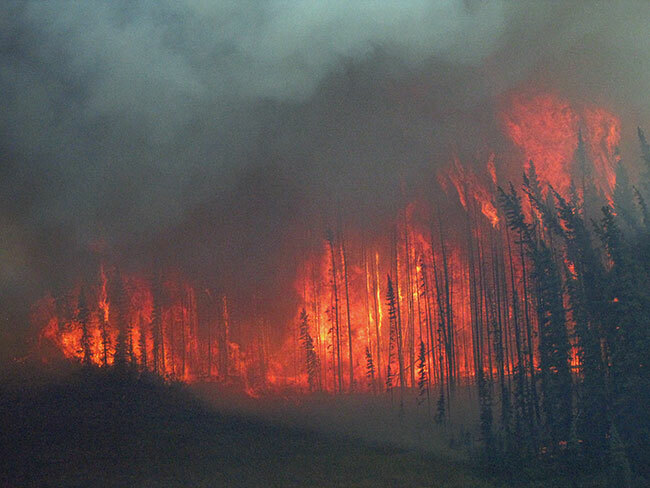 In 2009, the more than 3,000 wildfires in B.C. (consuming 66,000 hectares) cost the province some $297 million. Direct costs from the B.C. fires in 2017 exceed $500 million (and counting). Three fires in particular set this year apart with their sheer size and destructive force. The Plateau Fire saw 19 separate fires converge into one giant fire that was estimated in excess of 521,000 hectares. 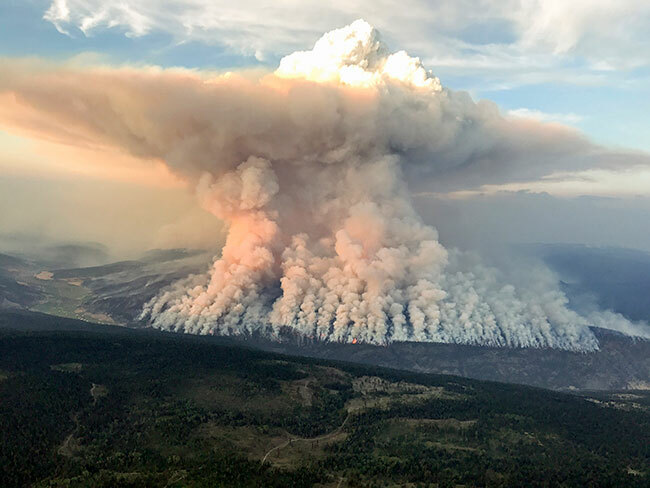 The Hanceville-Riske Creek fire was estimated at 240,000 hectares and the Elephant Hill Fire at more than 192,000 hectares. With each of these fires, a combination of pre-existing conditions on the ground coupled with high temperatures and strong winds produced a recipe for the perfect firestorm. Many local governments (municipalities and regional districts) declared states of emergency and, in an unprecedented move, the provincial government declared a state of emergency that lasted from the first week of July through the middle of September. Evacuation centres were opened in communities across the province to accommodate the more than 55,000 people forced from their homes by evacuation orders. A declaration of a state of emergency by a local authority (municipality or regional district) gives certain powers to that entity as well as allowing it to receive financial support from the provincial government. When the province declares a state of emergency, this in turn allows the province to receive financial assistance from the federal government, as well as assistance from the Canadian military and other federal agencies. With the exception of the military, which is generally highly visible, most federal assistance is at the senior management and policy level and not readily discernible. The Canadian Armed Forces describes its role as providing highly-trained personnel and unique resources tailored to the situation at hand. For the aviation role in this year’s fire assault, the Royal Canadian Air Force (RCAF) deployed one C-17 Globemaster, a C-130J Hercules, two CH-147 Chinooks and three CH-146 Griffons to B.C. The aviation assets did not replace civilian assets, but augmented emergency operations. So, how busy was 2017 for the rotary-wing community? Leanne Ingham, B.C. 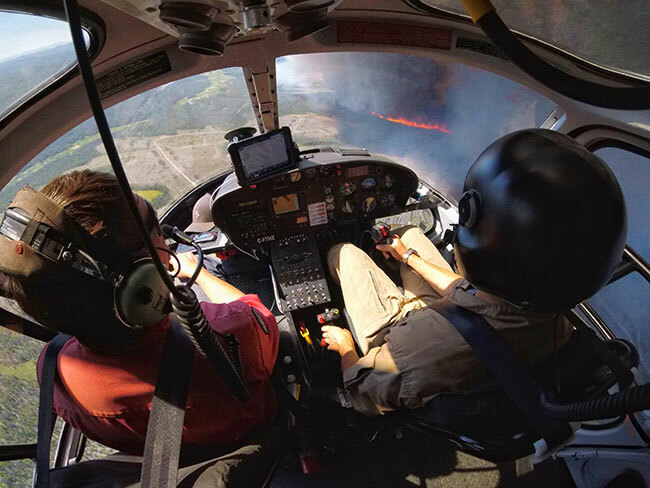 Wildfire’s superintendent of aviation management, notes more than 39,000 hours were flown by rotary operators and another 10,000 hours were spent on standby. 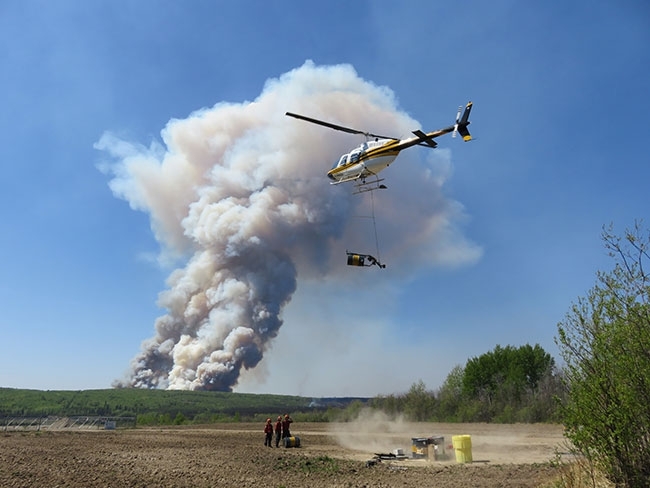 On August 9, the peak of helicopter activity, some 200 helicopters were fighting fires throughout the province. Ingham characterized 2017 as a “challenging year” but challenging in different ways depending which side of the coin you live on – wildfire agency or helicopter operator. Challenging translated as busy for many operators this year, but there was the question of the impact the fires had on other sectors of the economy that helicopter operators would normally rely on for their summer business – tourism, forestry, oil and gas, and mineral exploration to name a few – either because of the actual threat of fire, widespread forest closures or the number of helicopters working on the fires. 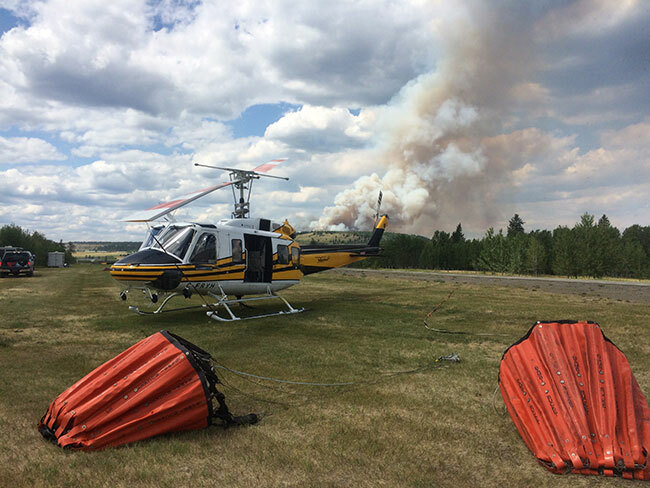 For Brad Fandrich at Valley Helicopters out of Hope and Merritt, B.C., the extensive fire season turned out to have little impact on their operation in terms customer inconvenience, but it did provide a nice jolt in the operational bottom line. Vancouver’s Talon Helicopters also had a busy season, as founder/operations manager Peter Murray explained. “We’re a base operation. We’re happy to do some firefighting and we do it if we’re needed, but we maintain the base for search-and-rescue and our other local customers. Summer’s always a busy season and we balance the workload around with what we had available.” One of those other jobs for Talon was flying a British documentary crew and filming fire activity. A Yellowhead Bell 208 lifts off with a drip-torch. Peter Barratt at West Coast Helicopters can look back over 42 years in the commercial helicopter business and while he’s definitely seen a change in the B.C. firefighting business over time, there has also been a shift in the whole business universe. Another prominent B.C. operator who wished to remain anonymous told Helicopters that his company has noticed a definite shift in the aerial firefighting business in B.C. As he explained, there are far more challenges now for some operators trying to keep up in acquiring shifts. For the first couple of months of the 2017 fire season, personnel from B.C. Wildfire were heavily involved in flood support work. But on the heels of widespread flooding in B.C.’s interior, temperatures spiked, the winds grew and a rash of dry thunderstorms in the first week of July literally ignited a firestorm. The Plateau, Hanceville-Riske Creek and Elephant Hills fires started in a window in early July, primarily the 6, 7 and 8. Like all fires they started small, but given that combination of dry fuel, hot dry weather and strong winds they were doubling in size in hours and just simply kept growing and growing. It’s not unusual to see fires grow this quickly, but usually there is a break in the weather or at least a reprieve that gives firefighters a chance to get ahead of the fire. This year, that break didn’t come. The weather was hot, humidity was low and winds were high. Fortunately, B.C. Wildfire has plenty of resources at its disposal to deal with the challenges. As Ingham notes, the province has a list of more than 140 helicopter operators on file, representing a potential pool of more than a 1,000 helicopters. It’s always important to have a diverse selection of aerial firefighting assets at your disposal when faced with the complexities presented during the 2017 fire season. But as Ingham notes, the availability of fixed-wing assets from other provinces – CL-215s and CL-415s – also created unique challenges as some helicopters and scoopers had to be kept apart. Given the complexities presented by the 2017 B.C. fire season, Ingham notes that she is pleased with the final safety performance of all operators involved. Which leads into the discussion at this year’s Helicopter Association of Canada Conference this November in Ottawa with Transport Canada (TC) governor generals Denis Guindon and Aaron McCrorie regarding new flight and duty time regulations, which could severely limit firefighting operations for operators and provincial firefighting agencies. The new TC regulations will impact the availability of resources when the agency is busiest, Ingham said. “And that’s a real concern for us. If we don’t have enough aircraft to do the job, then that’s a concern.” What complicates this is the reality that many operations in firefighting are conducted as both 702 and 703 on the same mission. HAC and the eight other Canadian aviation associations continue to fight the new regulations in the run-up to the consultation deadline between their publication in Canada Gazette I and Canada Gazette. “We continue to support HAC’s position on what the impact of this is on the industry,” Ingham said. “This year we had enough aircraft to do what we needed to do, but a few times this year we had companies that had to turn down contracts because they couldn’t stop an aircraft. Will the fatigue regulations increase safety the way Transport Canada is saying they will?